Venerable Theodore of Novgorod was the son of pious parents, wealthy citizens of Novgorod. Having been raised in strict Christian piety, he received a thorough education and especially loved studying Holy Scripture. Reaching the age of maturity, Theodore decided to devote himself entirely to Christ and the perfection of virtue. Imitating the lives of the saints, he imposed on himself a constant strict fast, in which he took food only once a day, as the sun went down, and on Wednesday and Friday he did not eat anything at all. 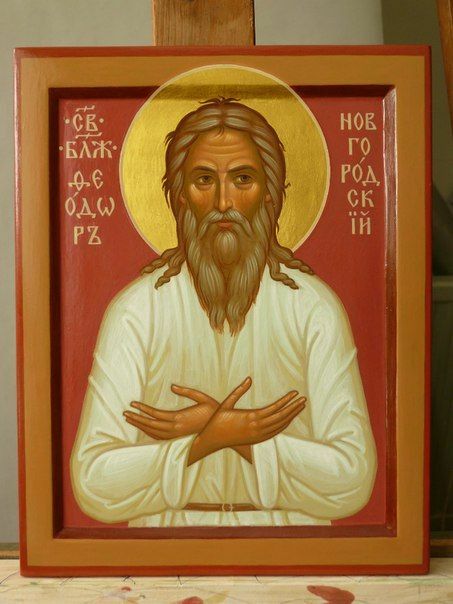 He often went to church services, visited surrounding monasteries for prayer and cared for the poor, giving abundant alms to the needy, especially the foolish for the sake of Christ whom he loved, and whose feats he sought to imitate. Thus he took on himself the ascetic deed of foolishness for Christ’s sake. Having given all his possessions to the poor, he lived in great poverty until the end of his life, not even having a roof over his head, nor warm clothes on cold days, going about barefoot all the time. He didn’t sleep much at night, but went around to the temples, praying for his native city and those living in it, asking the Lord for deliverance from foreign invasions, civil war, hunger and fire. During the day, he acted foolishly in crowded streets and markets. Often, for his strange and bold actions and speeches, which had a hidden goal to edify and save his neighbors, the blessed one accepted insults, pushes and beatings, but endured them patiently, praying for those who had offended him. 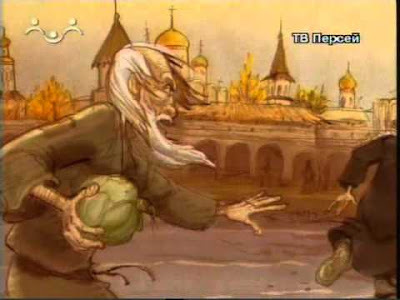 When he discovered a mutual enmity between the Novgorod citizens of the Torgov quarter and the inhabitants of the Sophia quarter, Theodore pretended to be feuding with Saint Nicholas Kochanov (July 27) who lived in asceticism on the opposite Sophia side. One day a resident of the Sophia side turned to the blessed Theodore with a request to visit his house. Theodore at first refused to go across the river on the Volkhov Bridge, referring to the hostility towards him by the blessed Nicholas, but then gave in to the intensified requests and went along with the inviter. At this time, Nicholas was roaming foolishly on the streets. Hearing of his opponent coming to the Sophia side, he quickly found Theodore and began to beat him with a whip taken from a rider passing by, saying: “Why did you, Theodore, come to our side, or do you want something to steal from us?” As Theodore ran back across the river, miraculously on the water as if on dry land, he was followed by Nicholas who did the same thing. Nicholas then threw a head of cabbage at Theodore, for which he was later called “Kochanov” (i.e. “cabbage-head”) by the people. Another day Theodore did the same thing when Nicholas chanced upon on the Torgov side, and he said to Nicholas: "Do not come on my side, live on your own!" 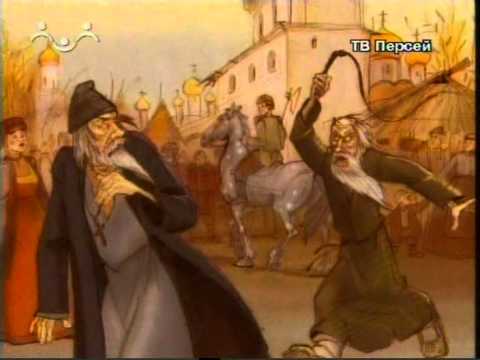 The blessed ones, spiritually in agreement with each other, by their unusual behavior reminded the people of Novgorod of their own internecine strife, which often ended in bloody skirmishes. 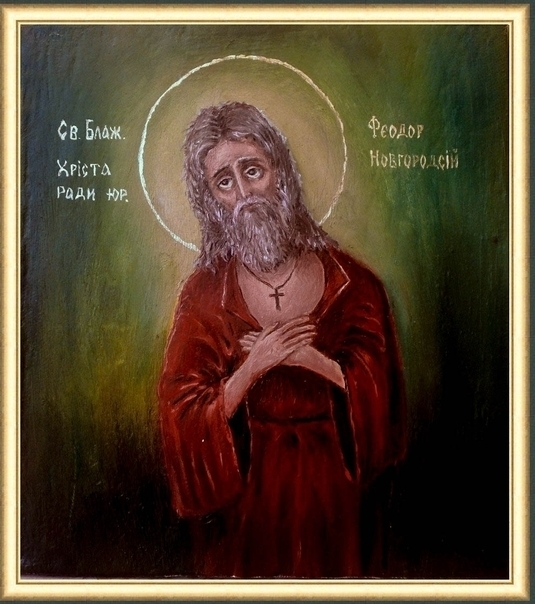 During his life, the citizens of Novgorod for the most part saw him as a saint pleasing to God, and had a high regard for him. After his death on January 19th in the year 1392, the holy fool was buried, at his request, in the Torgov quarter, at Lubyanitsa in the Church of the Holy Great Martyr George, at the porch where the Saint usually loved to spend his time in unceasing prayer. A chapel was built over his holy relics, and in time many who were sick received healing there.